Tanya Meets Tanya - Jessica Keenan Wynn interviews Christine Baranski about playing the sassiest Dynamo – Tanya. Rosie Meets Rosie - Alexa Davies interviews Julie Walters as the two actresses share their experiences playing Rosie. Dynamo Chit-Chat - A conversation between the three Young Dynamos reflecting on their favorite song, costumes, scenes to shoot, and funniest moments. Dad Chat - The young dads come together to share some of their favorite memories from set. Sophie's Story - Of all the characters, Amanda Seyfried’s Sophie has developed the most since the first movie. Here we will chart how Sophie has gone from a vulnerable young girl to a confident young woman following life-changing events. Choreographing MAMMA MIA! HERE WE GO AGAIN - Choreographer Anthony Van Laast and his team will reveal some of the secrets behind the highly original dance routines. Dancing Queen: Anatomy of a Scene - The most famous piano roll in musical history opens one of ABBA’S biggest hits, “Dancing Queen.” The number is the biggest and most complex sequence. Ol Parker will discuss where and how he wanted to use the song in the story. Performing for Legends - Here the Young Dynamos will discuss the daunting prospect of stepping into the recording booth at Air Studios to sing ABBA to ABBA. Class of '79 - The story of the Young Dads and Dynamos is told against the backdrop of Oxford, Paris and the Greek Islands of 1979, when hairstyles were wackier and the fashions were bolder. This featurette will focus on the Young Dads and Dynamos and their experience bringing these characters to life. 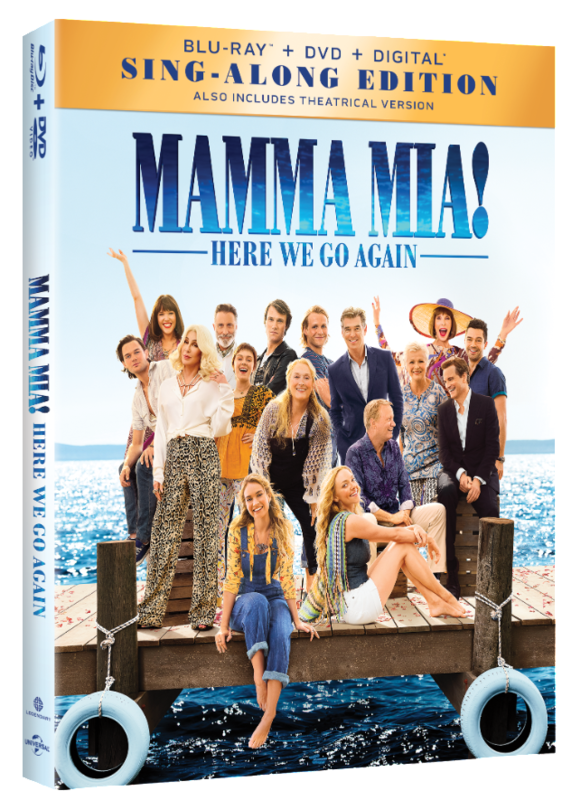 The Story - Producer Judy Craymer reveals how the MAMMA MIA! legacy began, evolved into the first feature film and how she teamed with executive producer/co-story writer Richard Curtis and director/screenplay writer Ol Parker to develop the perfect sequel. MAMMA MIA! Reunited - Focusing on the legacy performers and their excitement at reuniting a decade later, the filmmakers discuss the paths they’ve paved for the characters since we last saw them. Playing Donna - This piece centers on Meryl Streep’s cameo performance and Lily James’ preparation for filling this iconic role. Meeting Cher - The Queen of pop reveals her excitement at joining the MAMMA MIA! family as Ruby Sheridan – Sophie’s glamorous grandmother. Fellow cast members will share their delight at meeting and watching a legend on set. 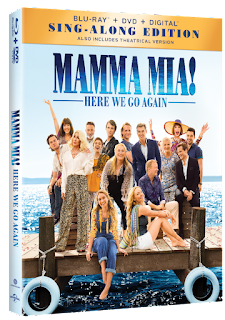 Costumes and The Dynamos - The Young Dynamos have some pretty cool costumes inMAMMA MIA! HERE WE GO AGAIN, and of course so does Cher. And who could forget those trademark dungarees? We will join costume designer Michelle Clapton as she highlights some of her favorite outfits from the movie. Curtain Call - Who can forget the finale to MAMMA MIA! when the cast danced onto cinema screens in full spandex for one final number? Ol Parker has chosen “Super Trouper” to close his movie and it features all 16 key cast members. Produced By: Judy Craymer p.g.a., Gary Goetzman p.g.a. MAMMA MIA! HERE WE GO AGAIN 4K Ultra HD is available in Dolby Vision™. Leveraging the HDR innovation that powers Dolby’s most advanced cinemas around the world, Dolby Vision transforms the TV experience in the home by delivering greater brightness and contrast, as well as a fuller palette of rich colors. Atmos enabled sound bar. Dolby Atmos soundtracks are also fully backward compatible with traditional audio configurations and legacy home entertainment equipment.